Although this month will be mostly about ice cream, we habe a lot of vegetables from our field to eat. Some of you with an own garden themselves might know these situations having some sorts of vegetables in abundance. Our zucchini, cucumbers and the squash are quite late this year. But we have a lot of swiss chard, lettuce and different kind of beans at the moment. Last year I already introduced you to this mangold quiche. But one recipe isn’t enough when it comes to the abundance of swiss chard. The stalks can be diced and frozen easily and the leaves can be used the make a delicious pesto, which can be also frozen. Like this I made half a dozen glasses of swiss chard pesto last year and it was a welcome change in the winter. It can be used either for pasta or as a pizza base instead of tomato sauce. Puree all ingredients in a food processor until fine. Season with salt eventually. The pesto keeps fresh in the fridge for a few days, therefore cover with olive oil. 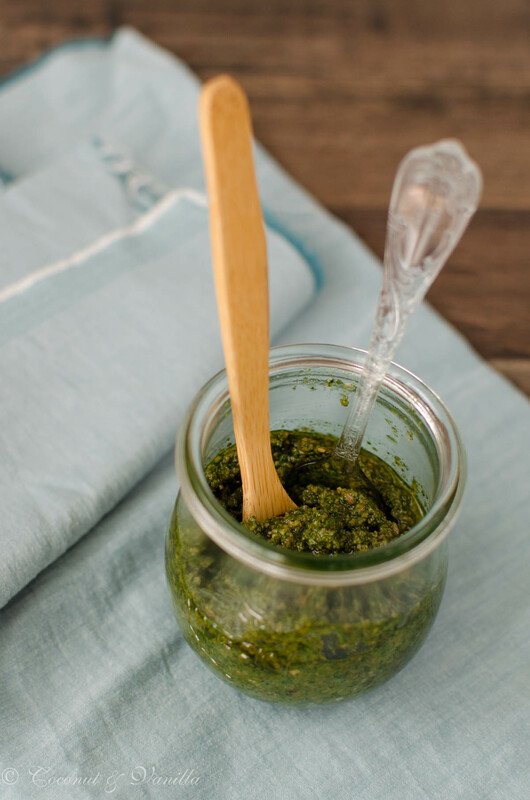 Or freeze the pesto in small portions in glasses or tupperware without any additional oil.